Source: Members of the nightshade family, most famously Atropa belladonna (or deadly nightshade). It is produced in high quantities in both the foliage and the delicious-looking berries. Chemical structure: Alkaloid. Atropine is derived from the amino acid phenylalanine. Its core structure is common to many psychoactive molecules isolated from plants. Historical background: Like many natural products, atropine has probably been in use for longer than we give it credit. Atropine-containing plants, like the nightshades, were commonly used over the last five centuries for a variety of medicinal purposes such as headaches, muscle spasms, night sweats etc. (the list is basically endless). Of course, these plants contain a wide range of molecules called alkaloids that are chemically similar to atropine but can have significantly different biological activities. It wasn’t until the 1830s that german chemists isolated and characterized atropine in its pure form. From that point forward researchers started to explore the diverse biological effects of pure atropine. Prevention of excessive sweating (hyperhidrosis). Also decreases salivary secretions leading to drymouth - though this is more of an irritating side effect than a medicinal property. Antidote?!?! Atropine serves as an antidote for potent nerve gases like sarin. This is because many nerve gases prevent acetylcholine breakdown leading to an overload of acetylcholine in the system. Since atropine blocks acetylcholine it alleviates the toxic effects of these noxious chemicals. Dangers: POISON! Nightshade berries are quite poisonous (due predominately to atropine content), causing extreme dryness of the mouth, dizziness, hallucinations and eventually death. As a poison, belladonna has a pretty glamorous history. It was rumored to be used by Emperoror Augustus and Agrippa (wife of Claudius) to poison their enemies, and it also pops up in many an Agatha Christie-esque murder mystery. In all seriousness though, these berries are to be avoided - their ingestion seems pretty traumatizing. Atropa belladonna was named after Atropos - of the three fates (from Greek mythology). Known as the “inevitable,” her role was to the “cut the thread” of a person’s life, and determine their manner of death. 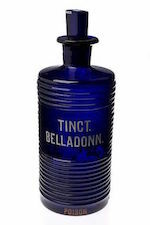 During the renaissance era women often used belladonna cosmetically. Since atropine causes the pupils to dilate, a drop of nightshade extract in the eyes gives that desirable wide-eyed look. This use for nightshade is why it is called “belladonna,” which means “beautiful woman” in Italian. Atropine is both a poison and an antidote. Does it get cooler than that? No.